Today continues the April A-Z Challenge. This month, I'll be blogging (almost) daily about a different speculative fiction trope, one for each letter of the alphabet. Today's entry is on Kryptonite. For those of you who've been on Mars for the last century, under a rock, in a cave, with your eyes shut and fingers in your ears, Kryptonite is the ore of a fictional radioactive element found on Superman's home planet, Krypton. Since Superman's creators had written him to be nigh invincible, they needed a plot device that would even the playing field for antagonists and preserve drama. Kryptonite was the answer. 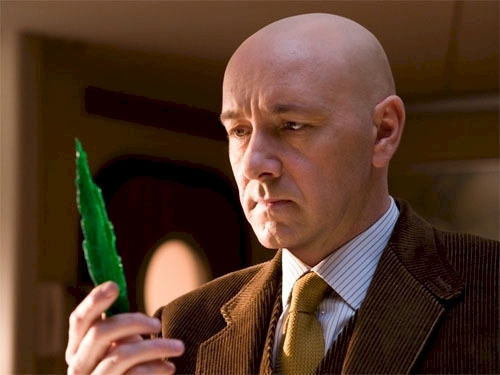 Harmless to humans, the glowing green rock (and its various offshoots) would rob Kal-El of his power and bring him to his knees. It was his one glaring weakness as a superhero. While Kryptonite is a great "K" word, this entry could just as easily have been named for Achilles. The central character of Homer's Iliad, Achilles was a mythological Greek war hero. While Homer never made mention of it, many later legends that spoke of Achilles attributed part of his ferocious skill on the battlefield to a mystical invulnerability. It was said that his mother, the sea nymph Thetis, had dipped him in the river Styx as a child in an attempt to make him immortal. Unfortunately, she failed to take into account that she was holding Achilles by the heel while submerging him, and that part of his body remained vulnerable. To this day, the phrase "Achilles heel" refers to an exploitable weakness that undermines an otherwise comprehensive strength. Of course, the Kryptonite factor applies to more than just mighty warriors and alien superheroes. Often the antagonist in a story might be in possession of powerful technology, perhaps a superweapon that gives them a dreadful advantage over the good guys. The hero will usually have to find some inherent weakness that the wielder of the weapon has overlooked. One of the best examples of a fatal fault amidst terrible power is the infamous "thermal exhaust port," a design flaw that allowed Luke Skywalker to destroy the seemingly invincible Death Star in Star Wars: A New Hope. My own work has yet to see the use of this trope, at least not in the traditional way. There are no supermen in any of my stories, or Death Stars for that matter. I think vulnerability is one of the most important traits a believable character can have, especially a protagonist. However, I have had a few characters whose "Achilles heels" were psychological, fears they had to supplant before finding the strength to overcome adversity. In my opinion, psychological Kryptonite is the most compelling, and the least likely to get me rolling my eyes as a reader. I'm still a comic book nerd at heart though, so if a little eye-rolling is necessary from time to time to keep me believing in superheros and their cliche weaknesses, so be it. Superman gets a pass. Nice connection between Superman and Achilles. Never would have thought about that! Another interesting read. You can find all kinds of mythological connections in places you might not suspect if you sniff around enough! Well spoken. Psychological Kryptonite is definitely a must if you don't want your readers to walk away sneering and one-star-reviewing. Flaws have indeed been used by storytellers to deepen the plot since the dawn of time. There are also pitfalls with psychological flaws, but quite easily to be avoided, like writing a mighty antagonist with a silly phobia, or a hero with a long list of qualities and only a single, embarrassing flaw that the antagonist just happens to find out about. In other news, -- Shadow of the Colossus? That classic masterpiece of atmospheric gameplay? Right on! You're right, a character's weakness can become the story's kryptonite if it's not handled well. And I can think of more than a few authors (some of them pretty high profile) with weak protagonists because they seemingly thought one superficial imperfection gave them an excuse to give their character all manners of Mary Sue/Gary Stu qualities. Shadow of the Colossus is amazing! I recently picked up the HD/3D rerelease (double pack with ICO) for the PS3. I haven't played it again yet, but I can't wait to see it in 3D. I can't wait for Team Ico's next game, the Last Guardian. It looks great! I do love me some Superman. I actually like Brandon Routh--wonder how the new Superman's going to do. I think he did a pretty decent job as Superman. I kind of wish they weren't rebooting it again for the next one. All of the comic book movie reboots gets a little tiring. Great "K" post! New follower here. I’m enjoying reading my fellow “A to Z”ers. I look forward to visiting again.